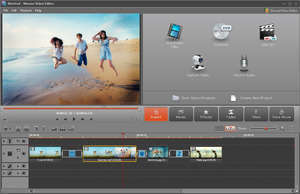 Movavi Video Editor is an application designed to offer a powerful yet easy to use video editing solution that addresses mostly home users or less experienced users who want to create a movie that will be shared online, played on mobile devices or stored as a DVD movie. The available features make the software an all-round solution for the editing of videos even though it does not offer as complex functions as other similar but more expensive software. Still, it compensates by providing a large number of preset video effects and transitions that can be applied on videos loaded and between them. Titles can also be inserted over videos contained in the project and audio narration may be added without requiring to record the voice audio with a separate program. Movavi Video Editor 15.0.1 is a shareware program and can be used as a demo to try the software until the free trial period has ended. A full version of the program is available after the trial period ends. For security reasons, you should also check out the Movavi Video Editor download at LO4D.com which includes virus and malware tests. Additional screenshots of this application download may be available, too. Movavi Video Editor has a presence on social networks.